Proper Hunt: Spring Is Here! Happy Friday! I can't believe how fast this week went! I had wanted to get this post out earlier in the week, but honestly, between the household chores, dealing with this cold (it's finally going away!) and Vivi's late night wake up sessions from teething (need.more.coffee), I haven't been on my A-game on the blog. My bad, guys! But I'm on the mend and I'm really hoping to get a head start on next week! We've been having some of the most gorgeous weather possible here in Annapolis (today is a tad dreary looking but it's warm so I'll take it! ), and it's got me busting out my Spring attire. It's also got me wishing for new Spring attire, hehe. Which brings me to some of these pieces above. 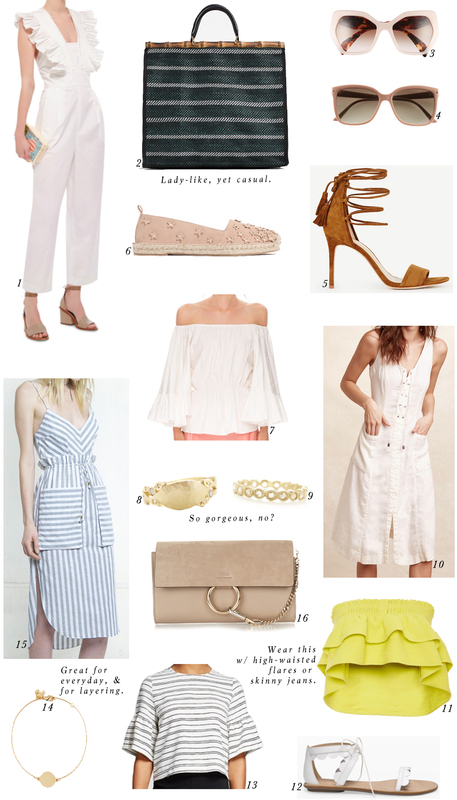 I've really been drawn to neutrals lately with the occasional pop of color and this wish list is no exception. If you follow me on snapchat (username: properhunt), you know that I ordered those Cora heels at 40% off! Use code FRIENDS40 to snag them and other goodies from Ann Taylor right now. Some of these pieces are definitely a bit pricier, but aren't they just so pretty? Like those Jennifer Dawes Design rings?? Gimme gimme, please! Okay, time to get ready for a morning meeting I have (more on that on snapchat!). I hope you all have a fab weekend! Happy shopping!